The prodution line adopts European advanced technology to produce various kinds puffed leisure food . 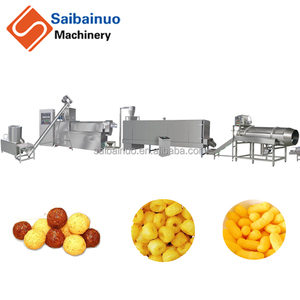 In addition :By changing dies(molds) of extruder ,the line can produce various shapes leisure puffed snack food. 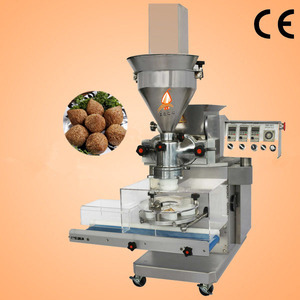 Also by changing th screw and some auxiliary equipments, it can produce the traditional fried snack food. This processing machinery is suitable for the pet food,dog food,cat food and fish feed and shrimp food. (2) The pet food generally consists of meat,cereals,grain,vitamins and minerals. The general grains,such as soyabean meal,corn meal,cracked wheat,and barley,are ofen used to improve the consistency of the products. 6. Machines Materials: All the machines are made by food grade stainless steel. Outside: wooden case for all machines(the kinds of wooden case or pellet depends on clients' requirements). Free training of equipment maintenance and operating personally; 6). 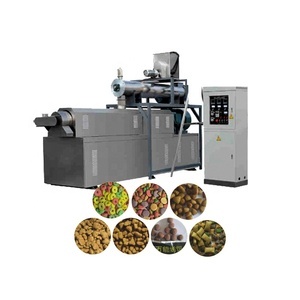 Factory best selling dry dog food making extrusion machine 1. dog food machine introduction We could change the configuration of pet food extruder according to the output you want. You could get many flavors, new shapes, good tastes, nutritional pet food by adjusting raw materials, water, temperature of the processing line. If you are intended to start your business to make feed pellets in small or large scale, please do not hesitate to contact us for details. 1 YRS Qingdao Umeide Trade Co., Ltd.
12 YRS Jinan Chenyang Technology Co., Ltd.
We can guarantee customers superior quality machines up to design requirements and perfect working state. d. We can guarantee customers superior quality machines up to design requirements and perfect working state. Our technicians can also provide all kinds of relevant technology to make the food production clean, healthy and safe. 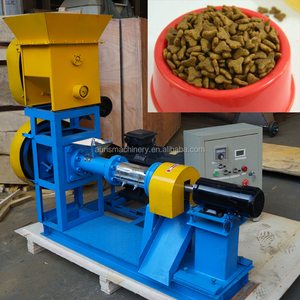 This dry type fish feed machine is an ideal for small and medium fish farm holders or feed processing plant. 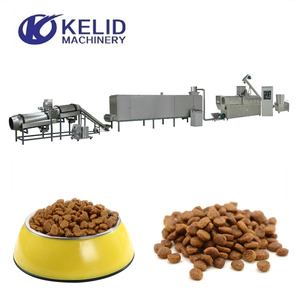 2.The dog food making machine is widely used in production of animal feed, such as dogs, cats, fish, foxes, birds and other pets. it also can be used in dog food processing plant ,which from raw materials crushing to finished products packaging, an be finished at one time. Alibaba.com offers 26,320 food extrusion machine products. About 25% of these are pet food processing machines, 4% are plastic extruders, and 1% are plastic blowing machines. A wide variety of food extrusion machine options are available to you, such as dog, fish. You can also choose from free samples, paid samples. There are 26,320 food extrusion machine suppliers, mainly located in Asia. The top supplying country is China (Mainland), which supply 100% of food extrusion machine respectively. 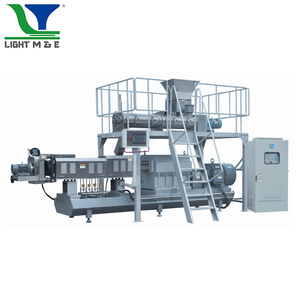 Food extrusion machine products are most popular in Africa, Mid East, and Domestic Market. You can ensure product safety by selecting from certified suppliers, including 5,794 with Other, 4,045 with ISO9001, and 686 with BRC certification.